The Dagon Funeral Home of Hornell, NY is the oldest family owned & operated funeral home in the area. Established in 1883 by James B. Dagon, the tradition of excellence has continued for five generations. In 1883, only 18 years after the Civil War ended, James B. Dagon (my great-grandfather) established the “Dagon Undertaking Parlor” here in Hornell. Embalming was in its infancy, and James B. was truly one of the pioneers of the embalming procedure. In 1912, he was joined in the business by his son, James J. Dagon (my grandfather) who, would eventually take over the business when his father (great-grandpa Dagon) died in 1920. James J. Dagon Sr. saw many changes in the funeral business during his 35 years of serving the Hornell community. During his tenure, embalming became the norm, allowing families ample time (usually several days) to say “good-bye” to their loved ones. It was also during this period that “modern day” funeral home came into existence. 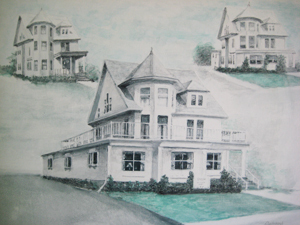 In the early 1940’s, Grandpa Dagon purchased the “Babcock Home” at 38 Church St., Hornell and the Dagon Funeral Home has remained at the same location ever since. For the first time, families slowly began having calling hours & services at a place other than their own homes. Another change during this period was that the horse-drawn carriage was replaced by the modern hearse. James J. Dagon Sr. died of cancer in 1947 at the age of 52. His son (my father), Jim Dagon had been majoring in pre-law at Sienna College when his father was diagnosed with cancer. Dad was planning a career in law but changed his plans when his dad died. After Grandpa Dagon’s death, dad enrolled in the Renouard School of Embalming in New York City. For the next 2 years, the Dagon Funeral Home was managed by Bob Mason, a licensed funeral director and a good friend of the Dagon family. Following his graduation in 1949, dad took over the operation of the funeral home. In 1960, he remodeled the funeral home, making the facilities much larger. My father was very aware of the history of the funeral home and was able to keep and use many of the light fixtures that his father had installed when he first purchased the building. 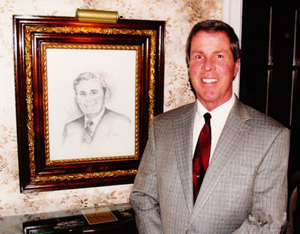 I, Jimmy Dagon, began working at the funeral home in 1972 and have been a licensed funeral director since 1974. My sister, Molly, obtained her funeral director’s license in 1977 and was active in the business for several years. In 1978, we purchased & demolished the home next door, enabling us to finally have a parking lot. I was fortunate to have worked side-by-side with dad for about 11 years. He taught me everything that I know about the funeral business and about people. A nicer & fairer man has never walked the face of this earth! He died of cancer in 1983 at the age of 56. Following the death of my father in 1983, I purchased the funeral home and continued the “Dagon Tradition”. Although I realized that I had big shoes to fill, I knew that I was not alone. My mother, Marieka “Ricky” Dagon, stepped in to help. Although she was not a licensed funeral director, for the next 23 years mom helped with calling hours and worked each and every funeral. The Hornell community seemed to embrace mom, and I know that everyone liked the idea of a woman helping with funerals. I will always be grateful for mom’s help & assistance as she added a “touch of elegance” to the previously all-male funeral home. In 1989 I remodeled the funeral home, nearly doubling the size of the facility. Just as my father did in 1960, I also made a point of keeping the lighting fixtures that Grandpa Dagon had installed so many years ago. I was able to modernize the funeral home, making the facility handicap accessible, while keeping with the colonial style of the original building. During my tenure there have been many changes also. Calling hours have gone from three days down to one day or sometimes no calling at all. The cremation rate has risen from 2% to nearly 50%. Photographs and memory boards have been replaced by flat screen TVs and DVD Memorial Tributes. Personalization of the funeral has become the norm. The newest development (and I am proud to announce) is the fact that my daughter, Laura Dagon Picco has enrolled in embalming school and will be joining the staff of the Dagon Funeral Home. For the past 12 years, Laura has served as a teacher at the Hornell Intermediate School. Laura has always shown an interest in the funeral business and has finally decided that the time is right to become the 5th generation of the Dagon family to serve the Hornell community. I certainly look forward to working with Laura — it is a father’s dream come true! Once again, the Dagon Funeral Home will be graced to have a woman assisting with funerals. Throughout the years there have been many “unsung heroes” that have helped out and worked in one capacity or another at the Dagon Funeral Home. Some were licensed funeral directors and others were not. Each played an important part in keeping with the Dagon tradition. Some of these individuals that come to mind are Bob Mason, Jack Andrews, Bill Livingston, Cornelius “Butts” Leahy, Bud Brundage, Danny Willard, Bud St. George, Todd Forsythe, Phil Grandshaw, Bud Baker, Mike Robbins, Bob Grillo & Rich Scavo — just to name a few. I am grateful to each and every one of them! There is one thing, however, that has not changed since my great-grandfather established the Dagon Funeral Home in 1883. For five generations, the Dagon family has been & will always be committed to serving your family with dignity, sincerity & compassion.